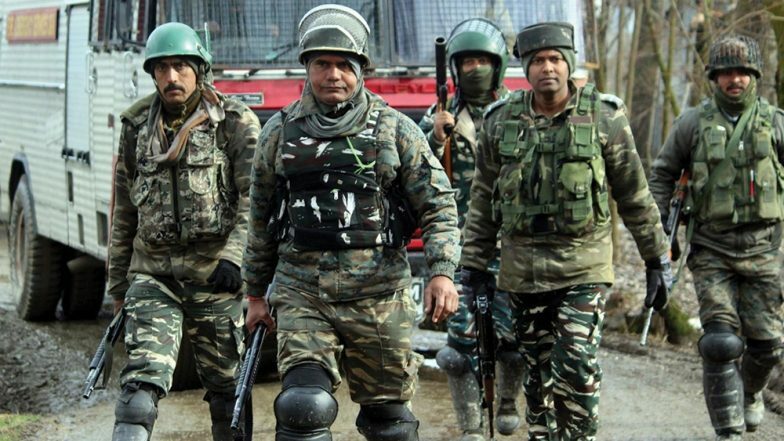 Shopian, April 13: In a major breakthrough for the security forces, two Jaish-e-Mohammed terrorists were killed in an encounter in Gahand Harmain village in South Kashmir's Shopian district. According to reports, the search operation was launched by a joint team of 34 Rashtriya Rifles (RR) of the Indian Army, Jammu and Kashmir Police and the Central Reserve Police Force (CRPF) after receiving a specific input about the presence of terrorists in the area. Jammu And Kashmir: One Terrorist Killed In Encounter At Bandipora. The gunfight broke out after the terrorists opened fire on the security forces. The terrorists were identified as Abid Wagay resident of Rawalpora Shopian and Shahjahan Mir resident of Amshepora Shopian. The forces have cordoned off the area, and combing operations are underway. According to some media reports, three army man and one policeman sustained injuries in the encounter. a huge amount of arms and ammunition were also recovered from the terrorists. Earlier, on March 22, six terrorists were gunned down by security forces in three separate gunfights in Jammu and Kashmir. Two terrorists and a boy, who was taken a hostage, were killed in an encounter in Bandipora district's Mir Mohalla area. While in Shopian district's Imam Sahib area, the security forces killed two terrorists following a gunfight. In another gun battle in Sopore's Warpora area, two terrorists were killed in the same site of an encounter on the previous day.